In this section we present the ceramic dining tables, an important innovation in the world of living room and kitchen furniture. 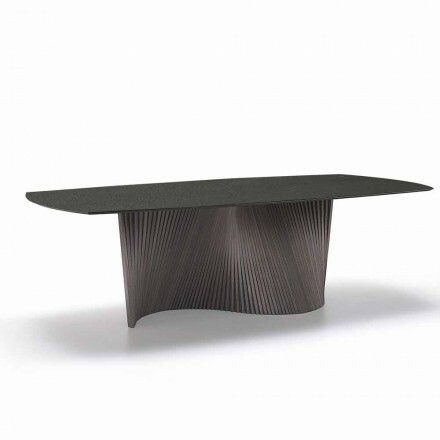 The reasons for the growing success of these tables are due to several factors such as: clean, contemporary and essential lines, high-tech materials, continuous innovation and research, high resistance to accidental damage. Among our proposals you will find the table models with "glass ceramic" top, those with a 1 cm thick glass slab with a 3mm ceramic layer on top. The end result is a material that offers a very pleasant aesthetic effect, refined, elegant and extremely resistant. Cooking at 1200 ° C makes it almost impossible to scratch the glass-ceramic top accidentally so that the tables with these tops can be safely used with hot knives and pots, without the risk of aesthetic damage (as opposed to tables with glass and wood top). Entering more in detail the ceramic materials of the tops have many advantages: they are very resistant (cutting, shock, abrasion, scratches, chemical agents, UV rays and heat), flame retardants and impervious to oils and oils repellents. Therefore they do not require special care or treatments and are easily cleaned. 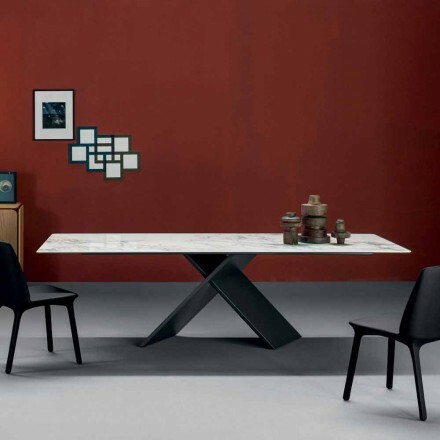 The frames and legs of the tables sold by Viadurini are usually made of wood, aluminium or steel with a rectangular top. Ceramics is an inorganic material. Clay is extremely flexible and soft at its natural state, and becomes rock-hard after the firing process. Its colour changes according to the chromophore oxides contained in the clays. Iron oxides can be yellow, orange, red-coloured, while titanium oxides can be white and yellow-coloured. At the final stage, ceramics is being glazed and decorated. Ceramics is suitable for the production of round tables, particularly those with a diameter of 120 cm, 160 cm and 180 cm, and especially for the production of tops. This material is characterized by a small thickness, a good resistance to cleaning products, to chemicals and solvents. The only product that can damage ceramics is Hydrofluoric acid. It also resists to humidity, thermal shocks, to scratches and surface abrasions. Different kinds of ceramics are available, like, for instance, porcelain and porcelain stoneware, which are extremely resistant to chipping. These materials are characterized by a low porosity and are impermeable to gases and liquids. Ceramic tables are easy to clean, but we suggest the use of neutral and alkaline detergents, and the use of a microfiber cloth. Rinse with water and dry the surface to avoid the formation of stains, which might be caused by detergents residues or by a hard saline water. Over the last few years, resistant and innovative materials are emerged; one of them is glass-ceramics. New-generation ceramics is often referred as super-ceramics, crystalceramics or Laminan, like the Italian brand that produces it. This material is made of one upper layer of ceramics, and a lower layer of glass, which make it even more sturdy and resistant. The material resulting from this successful coupling is oil/liquid/fat-repellent, it is heat-resistant and acid-resistant. It is scratchproof, easy to clean, non-corrodible and non-toxic. This material is suitable for the production of round tables with a diameter of 120 cm, 160 cm, 180 cm or custom-made ones. 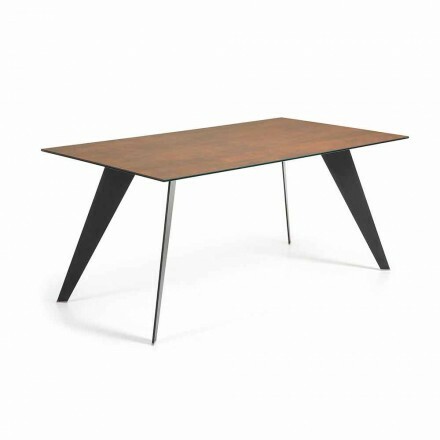 They are also suitable for extendable tables with a length of 120 cm,140 cm, 160 cm, 180 cm or more. We suggest the use of special detergents or creams. Apply them with a soft cloth, let it react for a couple of minutes, rinse and dry with a chamois cloth. Clean carefully. This material is beautiful, but easily scratchable.